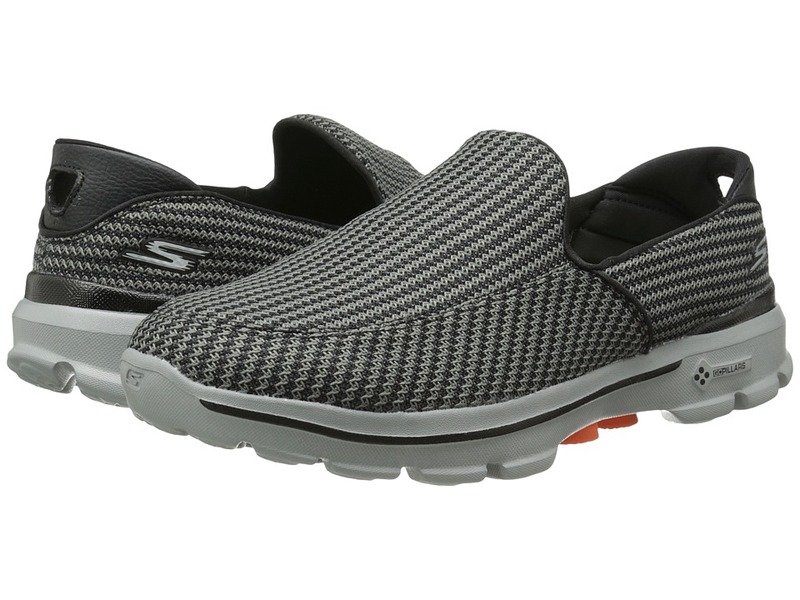 Never compromise style to achieve fitness, get the best of both worlds when you step into these stellar SKECHERS GO Walk 2- Engineered loafers! Easy slip-on wear. Four way stretch mesh upper. Smooth fabric lining is perfect for barefoot wear. GOimpulse sensors move together and independently to provide sensory feedback to the brain. A natural stride provides a more efficient and responsive walk. 360 Degree Responsive Flexibility allows your foot to move naturally. Resalyte Midsole - proprietary lightweight injection-molded compound with memory retention helps absorb impact. Super flexible sole. Imported. Measurements: Weight: 5 oz Product measurements were taken using size 8.5, width B - Medium. Please note that measurements may vary by size. Weight of footwear is based on a single item, not a pair. 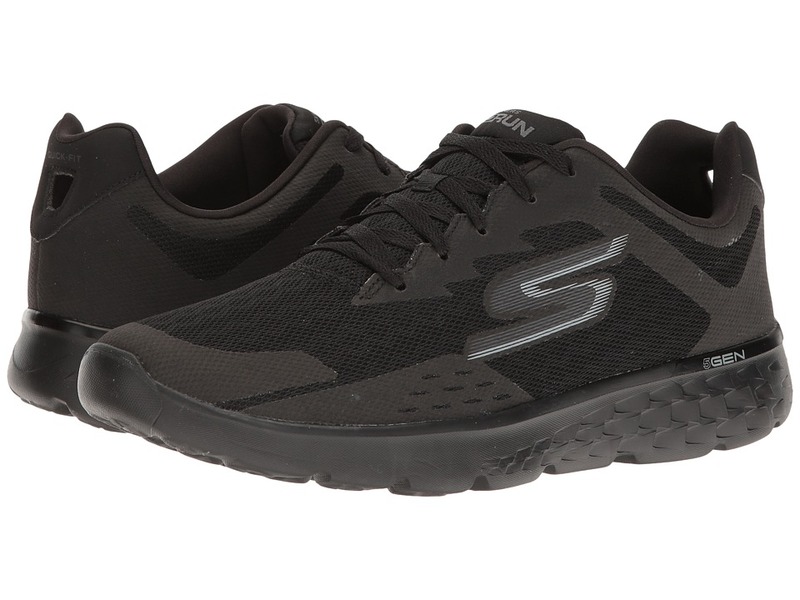 Stride your way through the day in the great looks of the SKECHERS Performance Go Walk 3. Woven textile upper with tonal stitching. Pull loop at heel. Pull-on construction. S logo at heel. Textile lining. Cushioned Goga Mat insole. Man-made outsole. Imported. Measurements: Heel Height: 1 1 4 in Weight: 7 oz Product measurements were taken using size 9, width D - Medium. Please note that measurements may vary by size. Weight of footwear is based on a single item, not a pair. 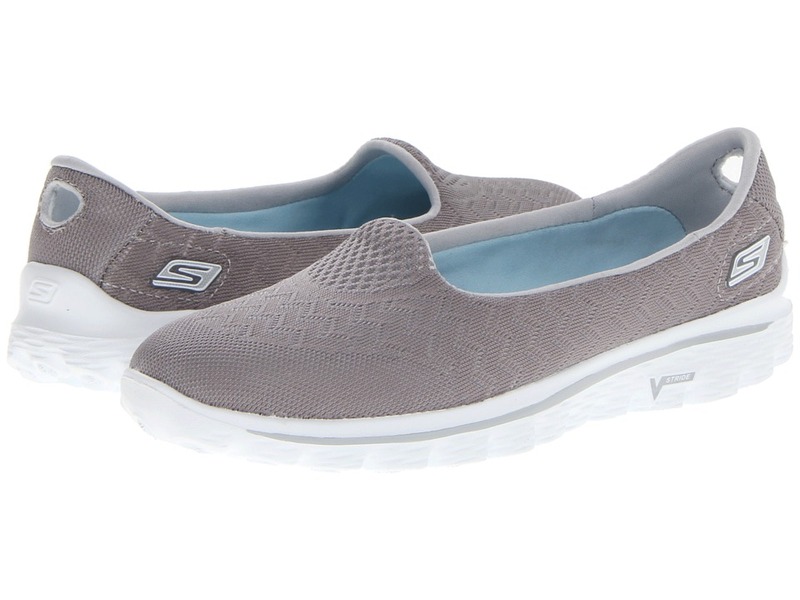 Over the horizon and through the woods are some really cute slip-on shoes by SKECHERS Performance, the On The Go - Mist! Sporty canvas fabric upper. ~SQUISH~ component with Resalyte material. Lightly padded tongue and collar. Three-eye medal eyelets lace up slip-on boat shoe. Stitched seam moc toe front. Textile shoe lining for good in-shoe feel. Insole made of Goga Mat Technology. Anti-microbial insole wicks away moisture and helps inhibit odor. Durable synthetic sole for various surfaces. Imported. Measurements: Weight: 5 oz Product measurements were taken using size 9, width B - Medium. Please note that measurements may vary by size. Weight of footwear is based on a single item, not a pair. 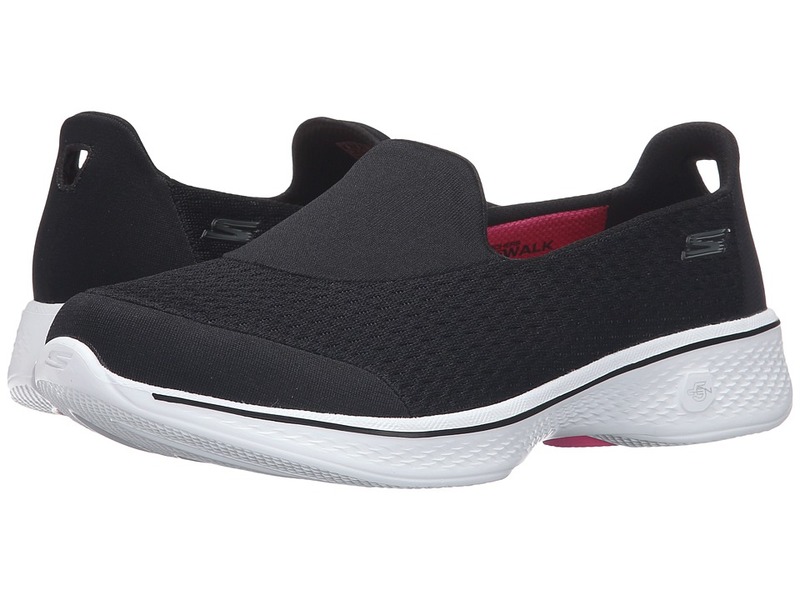 Take your walking routine to the next level in the SKECHERS Go Walk 4 Pursuit slip-on shoe. Easy slip-on design. Athletic mesh upper materials. Quick-Fit Portal at heel for an easier on-and-off. Smooth textile lining. Cushioned, breathable Goga Max foam insole. 5GEN midsole cushioning provides high energy return with each step. GO Pillars midsole and outsole technology supplies anatomically correct arch support and shock absorption. Multi-directional traction outsole. Imported. Measurements: Weight: 5 oz Product measurements were taken using size 8.5, width B - Medium. Please note that measurements may vary by size. Weight of footwear is based on a single item, not a pair. 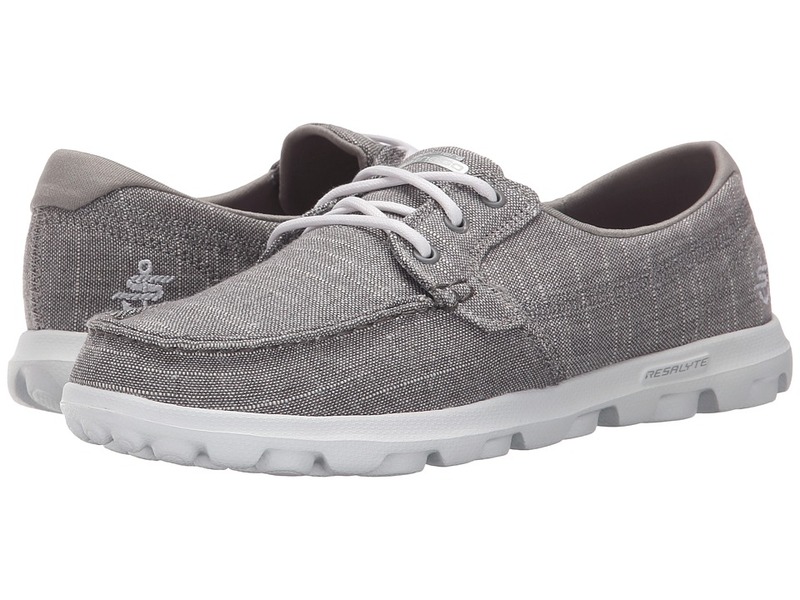 Get your step on in the SKECHERS Go Walk 4 walking shoe! Easy slip-on design. 3D layered mesh fabric uppers. Stabilizing synthetic overlay at toe, instep, and heel. Quick-Fit Portal at heel for an easier on and off. Cushioned, breathable Goga Max foam insole. 5GEN midsole cushioning provides high energy return with each step. GO Pillars midsole and outsole technology supplies anatomically correct arch support and shock absorption. Multi-directional traction outsole. Imported. Measurements: Weight: 6 oz Product measurements were taken using size 8, width B - Medium. Please note that measurements may vary by size. Weight of footwear is based on a single item, not a pair. 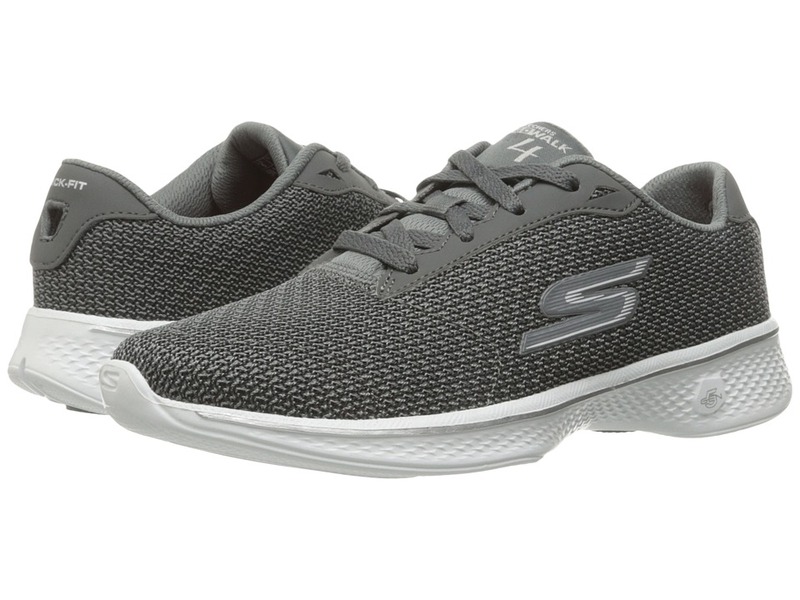 Stay on top of your fitness goals with the versatile performance of the SKECHERS GO Run 400 lightweight training sneaker. Predecessor: None. Support Type: Neutral. Cushioning: Lightweight, flexible response. Surface: Road/Indoors. Differential: Not provided. Ideal for treadmill runs and workouts. Breathable sandwich mesh and synthetic upper materials. Lace-up closure. Quick-Fit Portal at the heel for an easier on and off. Padded tongue and collar. Breathable fabric lining offers a great in-shoe feel. Goga Run footbed absorbs impacting shock. 5GEN midsole provides comfort and responsive cushioning. 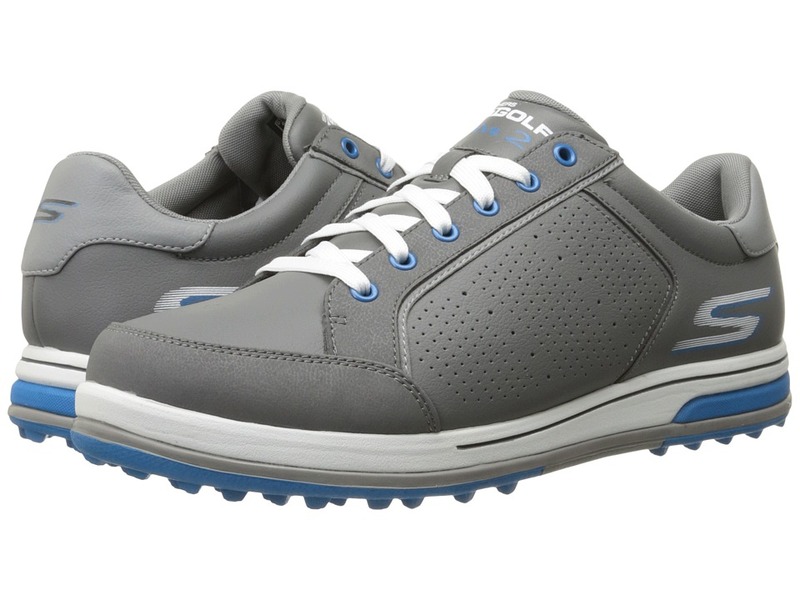 GOimpulse outsole sensors deliver responsive traction and ground feel. Imported. Measurements: Weight: 9 oz Product measurements were taken using size 11, width D - Medium. Please note that measurements may vary by size. Weight of footwear is based on a single item, not a pair. A casual weekend at the dock just got that much better with the Go Step - Shore. 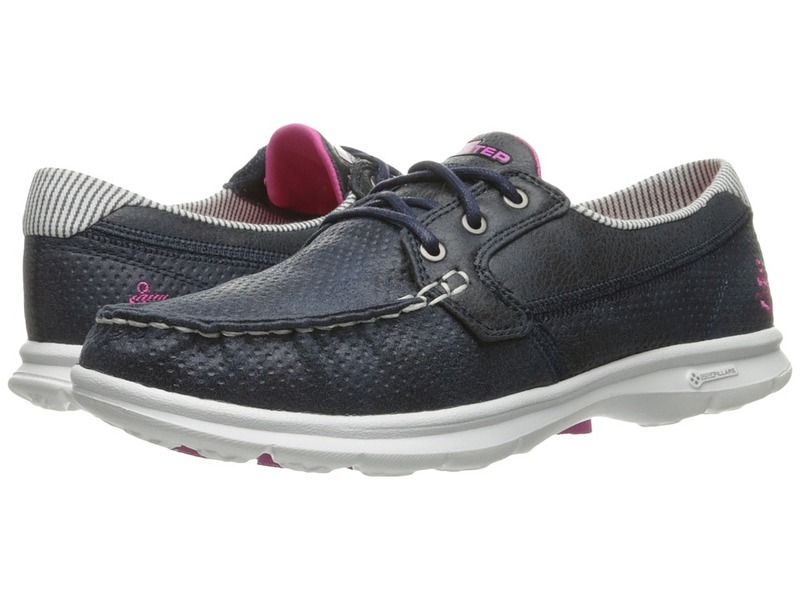 Synthetic leather uppers with a distressed look in a boat shoe silhouette. Adjustable lace-up closure. Memory Foam Fit padded heel cup for a cozy fit and walking comfort. Goga Max Technology footbed for added comfort. Lightweight Resalyte Midsole injection-molded midsole foam with SQUISH technology provides memory retention and helps absorb impact. Independent GOimpulse and integrated GO Pillars offer flexibility and underfoot responsiveness. Multi-directional rubber outsole for lasting traction. Imported. Measurements: Heel Height: 3 4 in Weight: 5.2 oz Platform Height: 1 2 in Product measurements were taken using size 7.5, width B - Medium. Please note that measurements may vary by size. Weight of footwear is based on a single item, not a pair. Get your weekend started with maximum support in the ultra-lightweight On-The-Go 400 - Vivacity. Soft fabric upper in a thong sandal silhouette. Easy slip-on style with a soft toe post. Soft textile linings. 5GEN midsole material delivers increased comfort and response. Goga Max technology provides energy return for all-day comfort. GOimpulse outsole sensors deliver reliable traction. Imported. Measurements: Weight: 5.2 oz Product measurements were taken using size 10, width B - Medium. Please note that measurements may vary by size. Weight of footwear is based on a single item, not a pair. 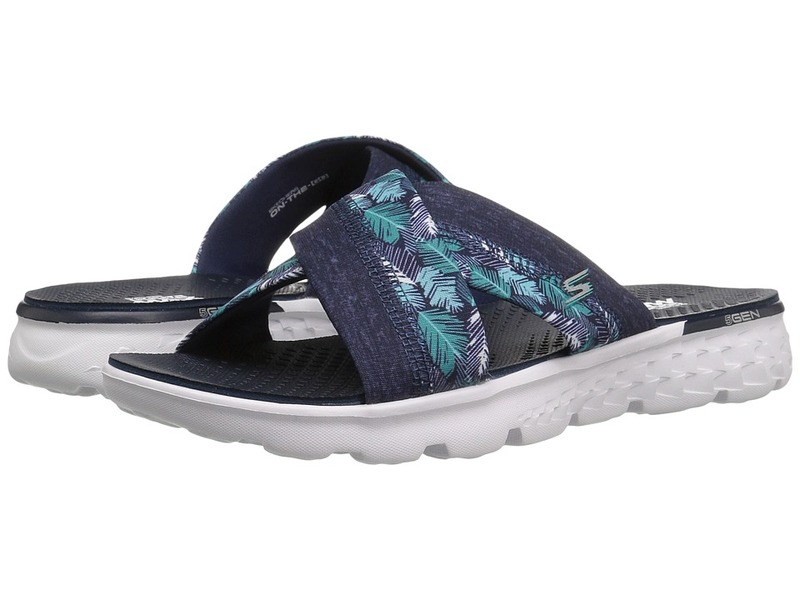 Kick back and dream of tropical breezes in this fresh and fab sandal from SKECHERS. Soft fabric upper with wide crisscrossing straps. Easy slip-on style with an open toe. Soft textile linings. 5GEN midsole material delivers increased comfort and response. Goga Max technology provides energy return for all-day comfort. GOimpulse outsole sensors deliver reliable traction. Imported. Measurements: Heel Height: 1 1 4 in Weight: 4 oz Platform Height: 3 4 in Product measurements were taken using size 8, width B - Medium. Please note that measurements may vary by size. Weight of footwear is based on a single item, not a pair. 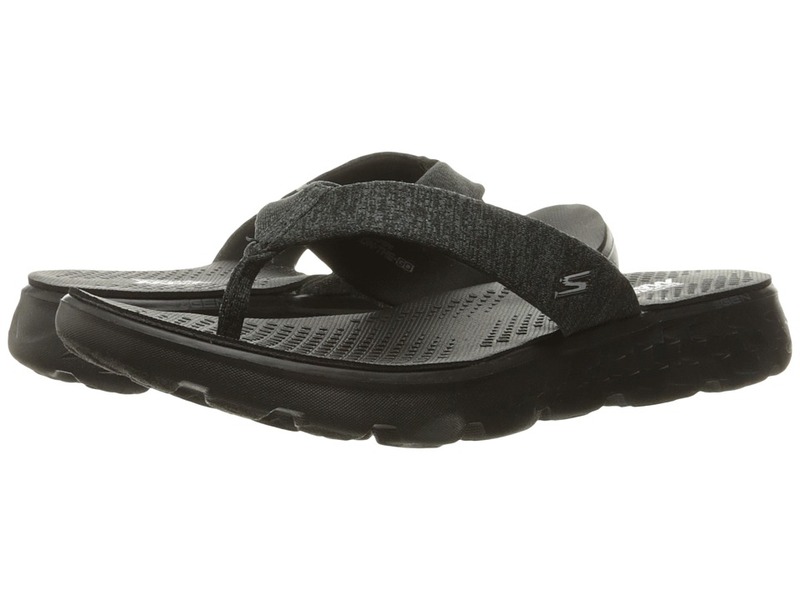 Get out and enjoy some sunshine and make a splash with this water-friendly sandal. Soft rubber thong upper. 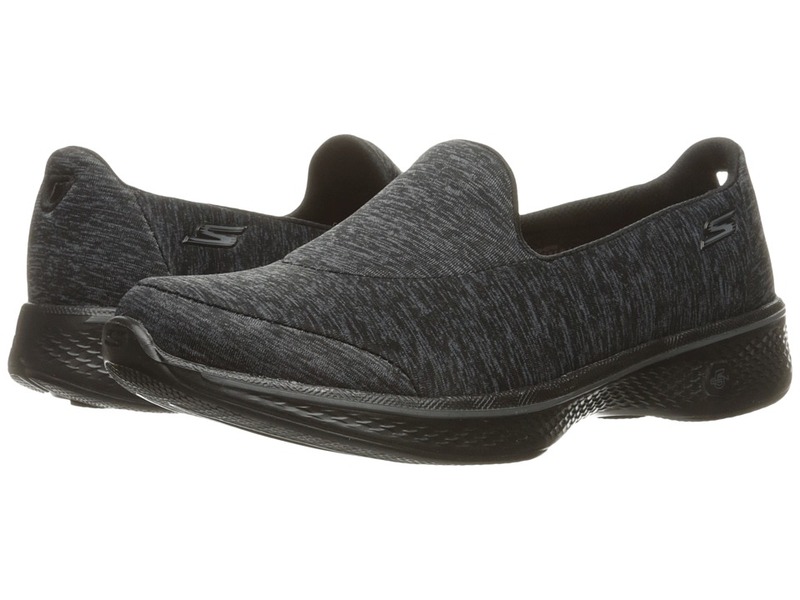 Easy slip-on design with a soft toe post. Goga Mat footbed technology. Lightweight Resalyte Midsole injection-molded midsole foam with SQUISH technology provides memory retention and helps absorb impact. 5GEN midsole cushioning provides high energy return with each step. Features Independent GOimpulse and GOga Pillars midsole and outsole technology for added flexibility and a responsive walking experience. Imported. Measurements: Heel Height: 1 in Weight: 4 oz Platform Height: 1 2 in Product measurements were taken using size 8, width B - Medium. Please note that measurements may vary by size. Weight of footwear is based on a single item, not a pair. Get up and get active in the Go Walk 4 - Glorify. Easy lace-up closure for a secure yet adjustable fit. Breathable 3D layered mesh fabric uppers. Quick-Fit Portal at heel for an easier on and off. Cushioned, breathable Goga Max foam insole. 5GEN midsole cushioning provides high energy return with each step. GO Pillars midsole and outsole technology supplies anatomically correct arch support and shock absorption. Multi-directional traction outsole. Imported. Measurements: Weight: 6.2 oz Product measurements were taken using size 7.5, width B - Medium. Please note that measurements may vary by size. Weight of footwear is based on a single item, not a pair.